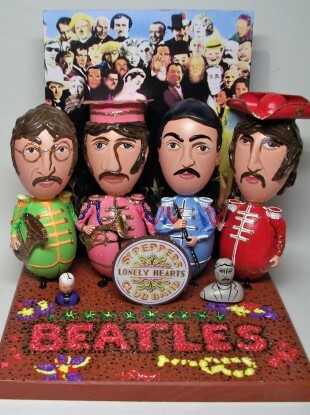 Even Beatles-themed Easter Eggs were available before the band's back catalogue appeared on iTunes earlier today. APPLE HAS UNVEILED what it claims to be a landmark development for its iTunes software: the inclusion of the Beatles in its online store. Astounding many commentators – who had anticipated the announcement of a so-called ‘cloud edition’ allowing users to stream music from the store at a discounted rate or for free – the company revealed that its longstanding dispute with the Liverpudlian band had been brought to an end, allowing the Fab Four’s 13 studio albums and four anthology collections to be added to the iTunes store. The Beatles had been the last major international act to withhold its catalogue from electronic sale; their output had been blocked from sale as part of a three-decade dispute between their label, Apple Corps, and Apple Inc (formerly Apple Computer), originally dating from 1978 but recurring over the intervening years. The resolution of the dispute leaves just AC/DC and Def Leppard among the major acts whose catalogues are still not available for download; other acts who had earlier resisted, such as Madonna who had opposed the ability to download individual songs rather than the purchase of a full album, later relented. The scale of the announcement has disappointed some, however; blog AppleBitch had suggested that new iTunes features could have included a “free, ad-supported format or a subscription-based model where users could pay a set amount each month for unlimited streaming”. Other potential features could have included the ability to sync devices like the iPhone or iPad wirelessly – a feature apparently allowed for in the forthcoming version of the iOS operating system used by the devices. Email “Apple's big iTunes' announcement: the Beatles now online”. Feedback on “Apple's big iTunes' announcement: the Beatles now online”.